Howdy and welcome to ToolGrrlz, a handy source of information, workshops, networking, not to mention the kitchen sink. Also under construction is the forthcoming HUB for Women’s Workshops in SoCo. More on that. We can’t wait! We are aiming for 1000 blog subscribers by 12.31.11 so pretty please click the button on the right to get our posts. They are fun and informative! We also want to be “liked” by just as many on facebook. Thank you for helping make ToolGrrlz a success! Check out the very first of many Workshops below. 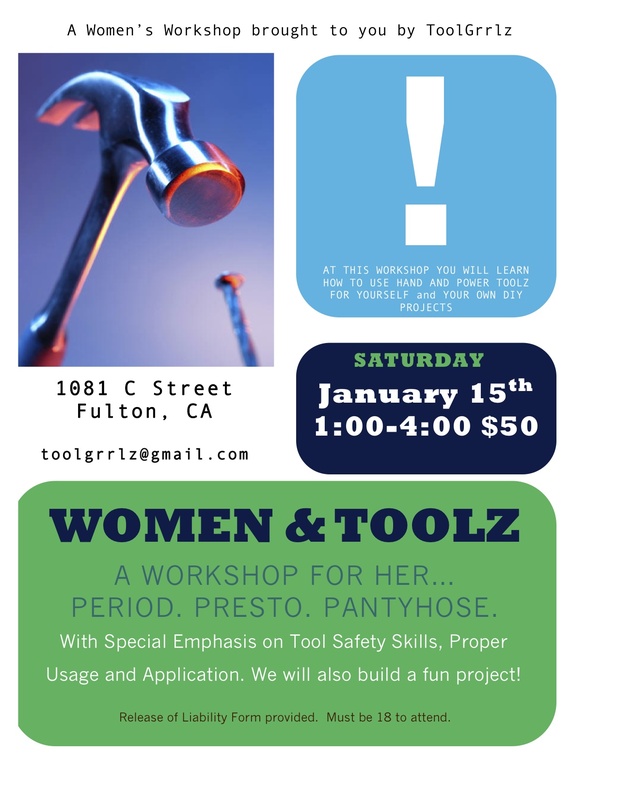 Women’s Tool Workshop Series. The Workshops will be monthly and each class will focus on a different skill set and toolz. We will demonstrate proper usage and application with special emphasis on SAFETY. We will also complete a mini-project with the skills you learn. Send us links to things you’re interested in building. The class runs 3 hours. Comments Off on Power [Toolz] to the Women!